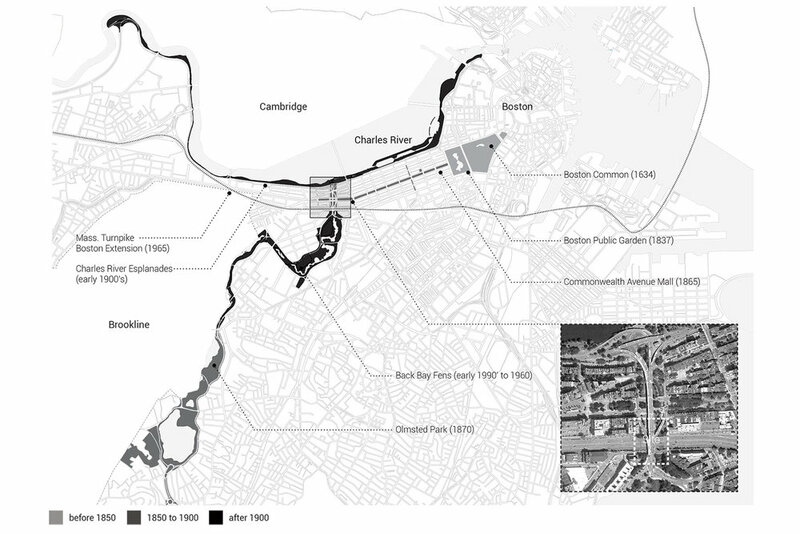 The project proposes a civic platform as an urban anchor bridging two notable public domains in Boston, The Fens and Commonwealth Avenue Mall. The site area is located at the part of the Emerald Necklace, the linear system of parks designed by Frederick Olmstead in 1837, where now Massachusetts Turnpike (I-90) slices through. Aiming to reconnect a park system in Boston, the project introduces a floating structure on the highway to offer a landscaped plaza and programmed boxes. The idea of urban reconnection starts from the first level. Here, the patchwork strategy, which consists of pocket parks and small plazas, allows continuous pedestrian ways and urban vegetation from the Fens to Commonwealth Avenue. Taking into account the current issues with large, monotonous, single-directional shopping malls, this alternative marketplace on the second and third level provides a new shopping experience. Alternating passageways from outside to indoors, and balconies with views toward downtown and urban wild in the Fens provide a new urban experience. Furthermore, in order to invite local residents’ participation, the marketplace offers public programs such as a community hall and classrooms. The invention of this ambitious urban platform generates new ideas for structure and material. The building form that consists of a series of small boxes is designed to overcome a notion of pre-dominated and dis-connected shopping mall within the neighboring areas. This design strategy, making courtyards and bridges between boxes, also allows more sunlight and natural air inside. 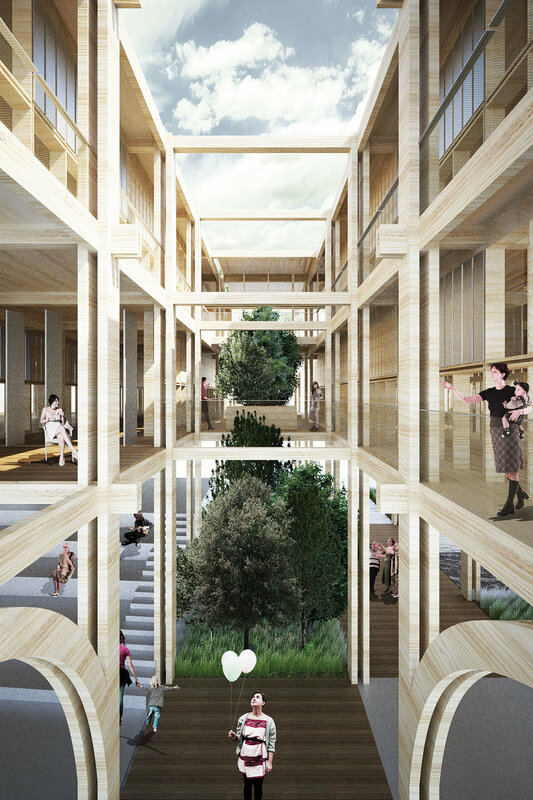 In terms of materiality, Cross-laminated timber (CLT) is used to offer low environmental impacts and less construction waste with enhanced structural performance. Finally, the project will become an iconic gateway for the people commuting in and out of Boston, as well as a reinterpreted Olmsted’s idea of urban parks.